Rice University’s Jesse H. Jones Graduate School of Business is one of the university’s seven academic units. The school was named after the late Jesse Holman Jones, a prominent Houstonian and world-renowned business and civic leader. The school received its initial funding in 1974 through a major gift from the Houston Endowment, a philanthropic foundation established by Jones and his wife, Mary Gibbs Jones. Rice offers three MBA programs: full-time MBA, MBA for Executives, and MBA for Professionals. The Rice MBA Program is accredited by AACSB International. 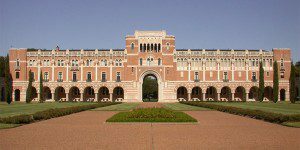 The faculty at Rice are highly accomplished, with professors in the business department being known for their numerous publications in scholarly journals. There are nearly 100 faculty members working in the business program, with 33 having tenure status. Academic areas that they teach include accounting, communications, entrepreneurship, and information technology, finance, marketing, organizational behavior, and strategy and environment. The most recent graduating class from Rice Jones featured over 340 students. More than 100 students are enrolled in the full-time MBA class, and 145 are enrolled in the professional MBA class.